Late-charging Johnathan Jones (#12J) got past Gramley with two laps to go and took second place, 2.226 seconds behind the winner. Gramley held on for third, followed by Nick Sweigart (#8) and Ryan Lynn (#26). Completing the top 10 were Greg Dabrosky (#88D), John Scarborough (#61), defending PASS champion Zach Newlin (11Z) , Dave Grube (#3D) and Cale Riegle (#99). The largest field in Central Pennsylvania sprint car racing so far this year, 43 cars, entered the race, and 25 of the 26 starters completed the distance. Entries came from as far away as Vermont and North Carolina. From his fourth starting position, Duke quickly assumed the runner-up spot behind Gramley, with Dabrosky, Lynn and Scarborough giving chase. At the race’s midway point, Gramley led by .697 seconds, but traffic gave Duke his chance on lap 12, and the 2016 PASS champ made the best of it. At one point his lead stretched to more than three seconds, before Jones, who moved from sixth to second over the last five laps, narrowed the final margin. Heat races were won by Scarborough, Gramley, and Grube. Heat winner Landon Price (#69P) was light on the scales and lost his victory, with Devin Adams (#99A) moving up to that spot. Twin consolation races were won by Michael Wenrick (#911) and Drew Ritchey (#880). Newlin and Ritchey were the big movers under green, advancing from 16th to 8th and from 20th to 12th place, respectively. 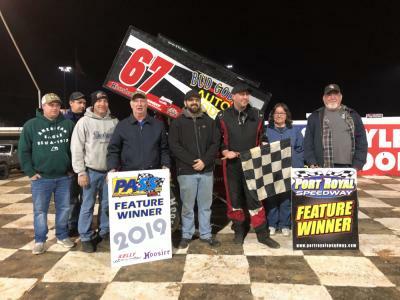 The Port Royal race began a weekend double for the PASS/IMCA racers, with action scheduled again Sunday at BAPS Motor Speedway, where the division joins 410 and 358 sprinters for an all-open-wheel show, beginning at 5 p.m.